Ramadan is just around the corner...a few days is all that is left between what I have been this past year...and what I hope to become during this Holiest of Months. I must admit...there have been plenty of times when the idea of You was the very last thing on my mind...I realize You are closer to me than my jugular vein...but You know better than me that I have been far from You. There have even been a few moments during this past year when I felt rebellious at Your plan for me...wanting to reject it and throw it behind me "like a thing forgotten"...but I can never really forget You...try as I might...You are in my heart...in my soul....in my blood. 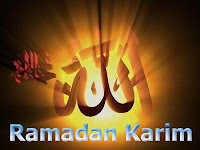 I anticipate the coming of Ramadan like a lover waiting for her love....with rapidly beating heart and lightheadedness....I yearn for Ramadan to arrive so to begin my metamorphisis...from earth dweller to heavenly seeker. I must admit God that I am often confused and hurt by Your plan for me and those near to me. I cannot understand why the lessons you teach must be hard and painful in order to learned and benefited from...I want ease in my life...I want the road...the path...to be smooth and uncorrupted with hate, pain, burdens or rejection. I wish only for ease of the soul...why cant I have this God....why must I bear these burdens when the burden quite often seems too heavy to bear...and cost more than Im willing to pay? Why cant the path to You be a straight shot without so much as a speedbump to slow me down...why? Sometimes I cry You know...of course You know. I cry from fear and pain...from uncertainy and anger...from feelings of uselessness and powerlessness in my own life. I rage against the night and greet the early morning sun with frustration and desparation to figure this all out and make sense of it....I never make sense of it...and so I cry some more. Why must I cry...how can You sit by and let me cry when You could vey well give me the answers I seek? I know Your there listening...so why? Ramadan is coming....let it be my solace...my panache...the healing balm to soothe my tired and weary heart. It has been a long year God...I have often felt that I travelled it alone...I hate to be alone...the worst feeling in the world is to feel that you are alone...I feel it God...I feel sometimes that You abandoned me and went off to spend some time with those that have a deeper faith in you...who wants to spend time with a crybaby who doesnt even understand the why's of it all....I wouldnt want to spend time with me either....but I dont like to feel alone. My soul often echoes with the loneliness of space...I long to fill it again God...help me to help myself. I am so sorry for your struggle. My heart was sad for you as I read your cry to God. I hope He touches you and brings you joy and lasting peace.